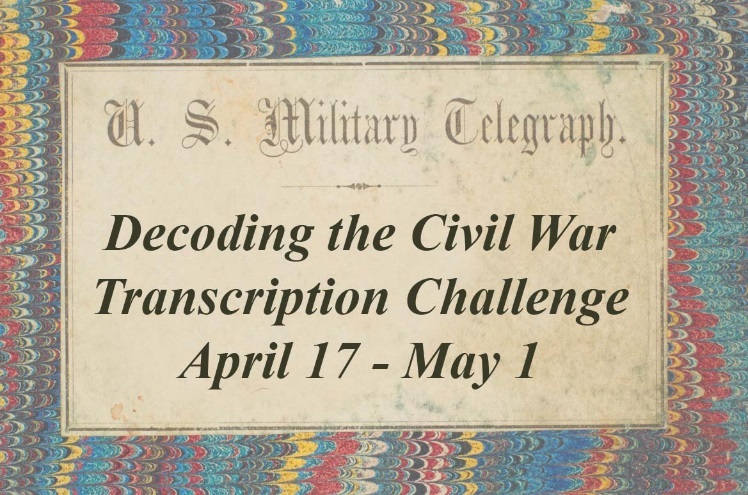 Our Decoding the Civil War project is holding a two-week transcription challenge between April 17 and May 1. The goal is simple, complete 10 Ledgers. Our volunteers have been doing yeoman’s work to turn out 200 classifications a day. Help us increase that to 425 classifications per day, and finish off the 10 ledgers, a total of 5904 classifications. If everyone reading this email does just one classification, we would easily beat this number. We can do this, and it will help get us back toward the long-term goal of having the majority of ledgers finished by June. But why accept the challenge? The canard is often repeated that libraries and archives are dead, or if not dead, then they are simply morgues for outdated material. Our work, all our work, has demonstrated that active collaboration, research, and discovery are vital. Our project, Decoding the Civil War has created new and exciting paths of research—paths that have been cleared by the hard work of the citizen archivists, like you, who have volunteered countless hours. Starting today, let us see what new paths can be carved and cleared. To keep track of our progress we will be resetting the statistics page to reflect only the ten ledgers in the challenge. And we, as well as you, will be able to see the classifications per day clearly. Check out our blog, and come back daily to see updates and new posts. Take up the challenge: 10 ledgers in 2 weeks at www.decodingthecivilwar.org. Previous Previous post: Ali Needs Our Help!